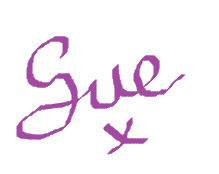 I thank Sue for her invitation to this blog page. My name is Mari Ishikawa. I live in Virginia Water, Surrey, England. I make lace mainly, and sometimes quilt or embroidery. I learned crocheting on my own from diagrams in books. My late grandmother had excellent crochet skills, and it seems that I inherited her talent to watch diagrams or real crochet very carefully, and reproduce them. I cannot follow written instructions of lace patterns at all. I do just watch and learn. I do the way my grandmother did. I prefer to make my products in traditional or published beautiful European designs. I am so happy to give life to what elegantly exists in good crochet books. At the same time, I like to create useful bags or purses showing traditional lace patterns and texture as much as possible. I also love fashionable English quilts, old and new, and to find high quality quilt patterns. My workshop is the dining table. I work here for measuring, drawing, cutting, sawing, knitting, and checking products. I also work anywhere in my house, on the sofa, in the bedroom. The only special tool I have is a very old ironing stand that I found at a flea market and re-padded with new fabric. 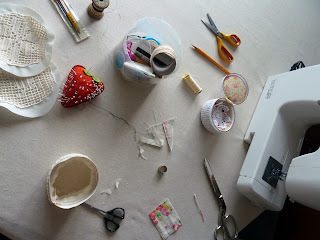 Yes, I love so much to make lace panels, doilies, cloths, bags, quilt …. It means I often make more than I do need. So I just wanted anybody who would like my handcraft and use them. Etsy is a wonderful place where we can buy and sell handcraft products and also exchange ideas. 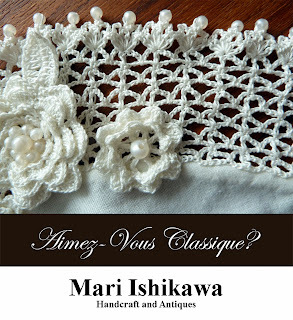 My Etsy shop, "Aimez-Vous Classique", was named after my belief that classic designs are the most beautiful, and also my daughter's profession as a classical music violinist. She introduced Etsy to me as her best friend was its member. I am pleased to exhibit here some of works that I am proud of. "Granny" bags, jewellery purses, tote bag, doilies, and some embroideries. You can follow me on Twitter and Pinterest, as well as Etsy, where I sometimes post something special that I do not put on the market. I hope you'll join me in thanking Mari and visit her sites.